That's right! Dusty and I are ranked #1 in the nation in Equathon and are tied for 2nd for individuals!!!! Hell yeah!!! 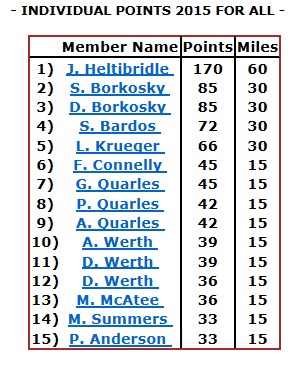 There are still a lot of races going on in the season out West which we don't have access to, but our team lead is pretty solid. We are missing the East Coast Championships this week due to Gem's injury, but we wouldn't have done the Equathon there anyway. The only way to get he shiny belt buckle is to complete the 30 mile RnT course, so we were planning on doing that instead. There is one final event we can make locally and do another 30 mile Equathon which I believe would cinch our team win and help maintain our individual status. It is back at Clemson in early October and I am itching to go. Pete is the obvious first choice for this event. Since it is an equathon he would only be doing 15 miles and he can handle that now at a conservative pace and by October with another 2 Paces and 4 weeks of riding he should be able to do it at a moderate pace. No big deal there. The issue is his feet. The vet here for whatever reason forces everyone to trot their horse out on the big, nasty gravel parking instead of the grass. I don't understand it and I don't like it, but there is no way around it. Pete is great on the trail footing, but I have big concerns over him trotting sound on that big gravel. Even in his hey day when he was training right alongside Gem, he always preferred to go on the softer footing while Gem would fly down the middle of the gravel road. I can't afford to buy him boots and he has really big draft feet that don't size up well anyway. My plan is to hopefully get a chance to trailer him out next weekend to the site and trot him on the gravel and see how he reacts. If he looks off at all, he will be out. Could Gem then step up and do it? Fitness wise, yes. 15 miles isn't something to completely scoff at and I doubt we would finish in the time we did last spring, but she will technically be allowed to trot by then and can handle the distance and those trails just fine. But should she? It will be her 2nd week back to trot work and I just don't think it is the right answer. Maybe if her Renegades work great by then and everything still holds together, but I just don't know. Her health isn't worth it. My back up plan is to post on the site and beg for a horse to borrow. Since it is the Equathon and therefor no risk of tying a strange horse to a tree and having them get injured or run off, I am hopeful that someone might be willing to do so. Cross your fingers for us!! I have never been ranked this high in anything, ever. I am so excited!!!! BIG congratulations!!! This is awesome! I hope you can find a horse to borrow! Can you hoof cast Pete perhaps, or apply Adhere to his sole? If you're only worried about the trot out then just some temporary cover for his soles for the trot out should be enough? Oh! I never thought of that. This is why I love comments!!! I will look into both those suggestions and see if they are doable for us. Thank you! You're welcome! ;) Neither is any good for riding any significant distance, but good for temporary protection. You can even just elastoplast the hooves if you think it will be acceptable for the trot out.